A late surge in activity at major shopping centres has eased fears of a disappointing Christmas for retailers. 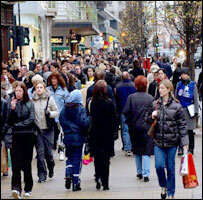 Enticed by early sales promotions, shoppers were thronging the streets at the weekend. "We've seen a really, really strong increase in sales this year," said David Robinson, general manager of the giant Bluewater shopping mall in Kent. "We're expecting another half a million people over the next couple of days up to Christmas Eve." A spokeswoman for the Central Milton Keynes Shopping Centre also reported that shoppers were out in force. "It's definitely picked up over the past week, but we were extremely busy at the end of November as well," she said. The upbeat mood defied predictions that retailers are set for a lacklustre Christmas as consumers rein in their spending following last month's rise in interest rates, the first for nearly four years. The pessimistic forecasts are based partly on official figures out two weeks ago which showed that retail sales growth fell last month to its slowest pace since July. A shock profit warning earlier this month from discount clothes retailer Matalan - formerly one of country's best-performing retailers - also sounded a gloomy note. The store blamed weaker than expected sales of high-cost items such as winter coats. Retailing icon Marks & Spencer, which pulled itself out of a disastrous sales slump just 18 months ago, is also reported to have suffered a dip in clothing sales during the run-up to Christmas. And FootFall, a consultancy which monitors the number of shoppers out on the nation's High Streets, has reported lower levels of activity this year. "The number of people shopping is down by between 1% and 3%, with people leaving their present buying until later," said FootFall business development director Ian Wilcock. But some experts believe the shops will be at their busiest over the next two days, arguing that many people have put off their shopping until after the last pay day before Christmas. "A lot of people think Christmas only started last Friday when they got their pay packet," said David Southwell at the British Retail Consortium. "The big shopping rush will be this week." "Some of the biggest names on the high street have decided it's time to drop prices"